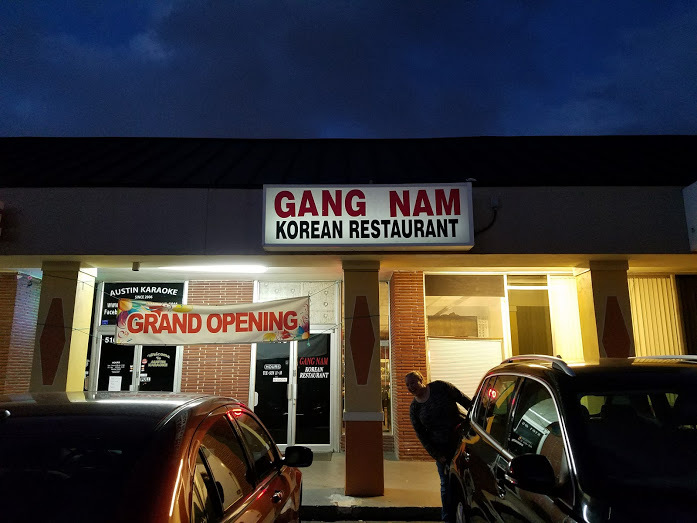 We learned Hon Korean Restaurant reopened under new management and it now this most delightful spot Gang Nam Korean, so we planned a road trip for dinner; we were well rewarded. Remodeled into a bright, uncluttered space the change was well needed. The room contains three cook tables in the middle, that seat six, plus regular tables on each side. Service is significantly improved, and the one server working managed the almost full house like a pro. 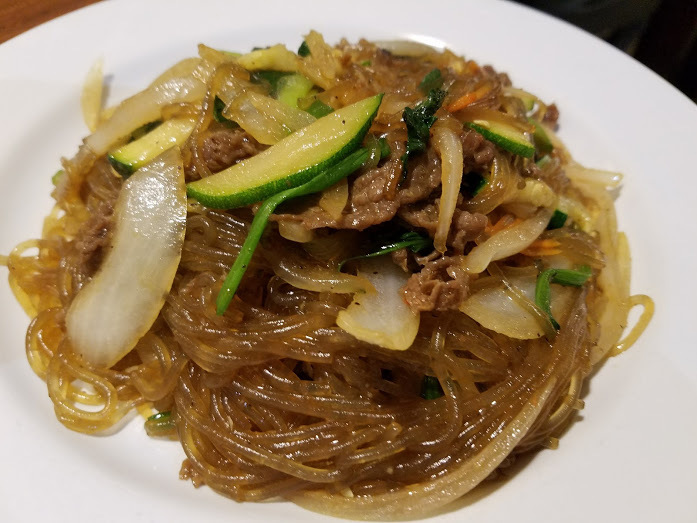 Not being overly familiar with Korean food we asked for assistance with some of the dishes that interested us. Our waiter proved to be very patient and helpful in assisting us In our choices. Here is a sample of our selections. 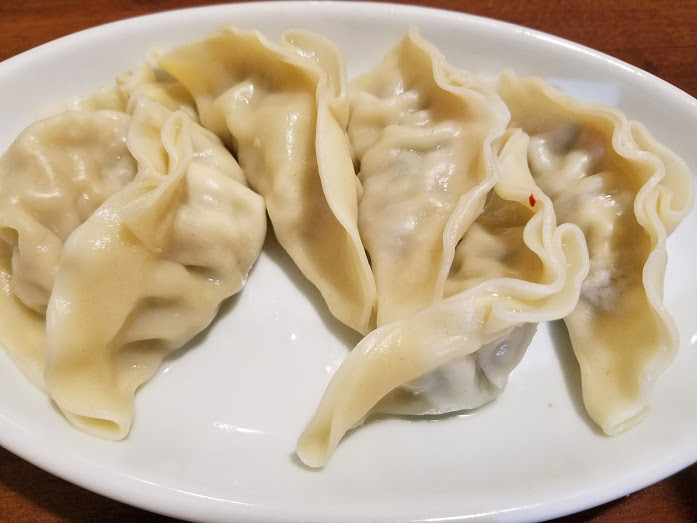 First up Steamed Dumplings, something we always order when eating Asian food, these particular morsels were better than most I have eaten. Skins nicely steamed, stuffing tasty and well spiced, served with ample dipping sauce. 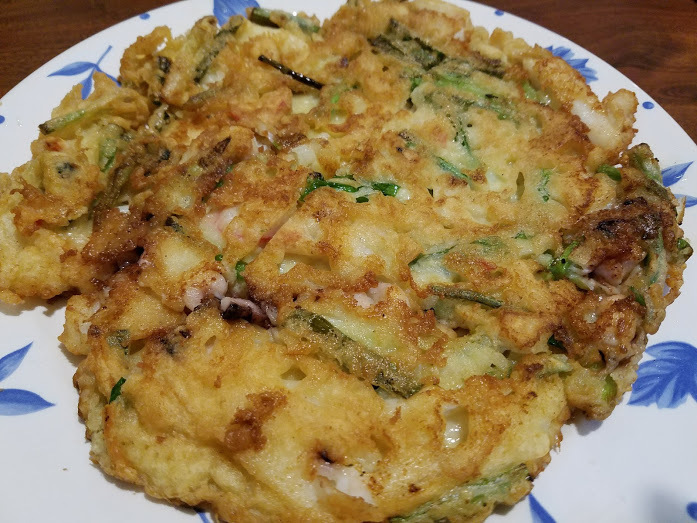 Next, the Seafood Pancake, we agreed this might be one of the best we have tasted here in town. Crispy chocked full of assorted seafood, and scallions. 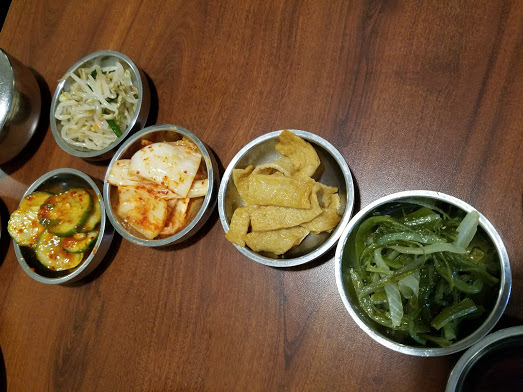 An excellent assortment of Banchan those delicious side dishes served at Korean dishes arrived along with our Pork Bulgogi The selection of Banchan offered up, sweet, sour, spicy and salty flavors and paired well with the Bulgogi delivered sizzling and aromatic. An order of Japcahs, clear noodles, vegetables, and beef in soy sauce was our last choice. Another winning dish, flavors of sesame oil and soy pleased our taste buds, leaving us wanting more even after we finished the meal. 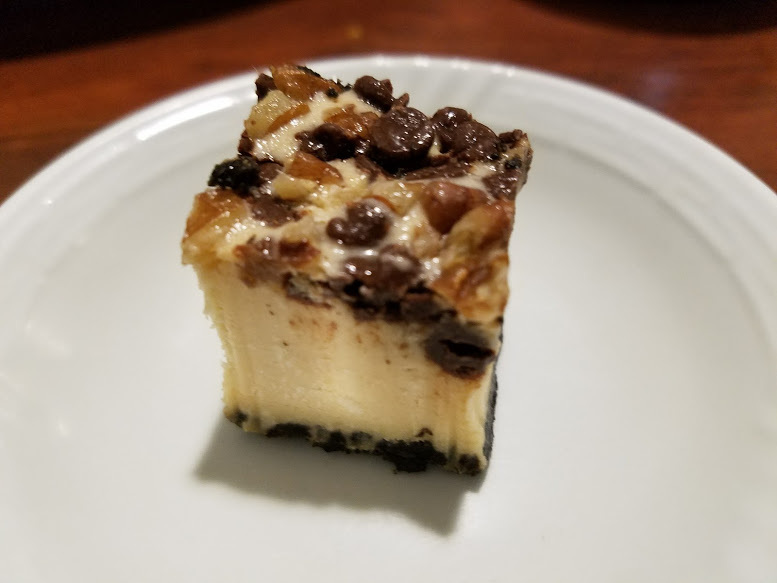 For the final, our server brought each of us a small square, of what appeared to be a cheesecake based dessert item adorned with chocolate chips and drizzled with caramel sauce. I may have been able to eat about four more that is how appealing I found them. Overall, the new owners have done a stellar transformation to this restaurant, it is now a bright, clean space that provides tasty meals. 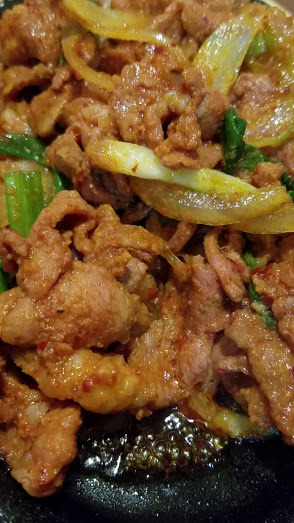 We both agreed service and food proved to be very much to our liking a vast improvement over our previous experience at this location. 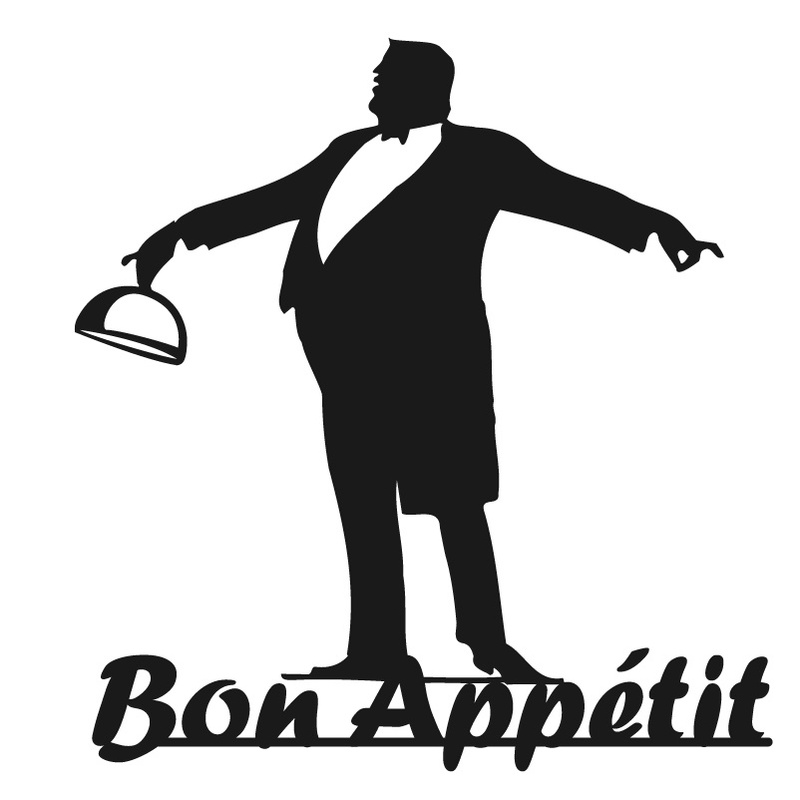 This restaurant will stay on “ our let’s go to list” we heavily encourage you to give this spot a test run. Be adventuresome and order something strange and daring. We may not have been as adventuresome as we could have been, but now we know how good it is next time I may just point to a picture and say bring it!